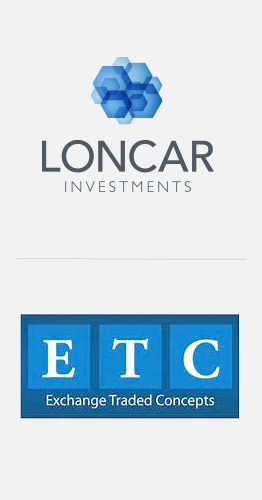 Oklahoma City, Okla. – February 15, 2018 – The Loncar Cancer Immunotherapy ETF (Nasdaq: CNCR) recently surpassed $50 million in assets under management (AUM), marking a pivotal milestone for the fund. Launched with a modest seed investment of $2.5 million on Oct. 13, 2015, the ETF has been offering exposure to public companies at the forefront of cancer immunotherapy research for more than two years. Cancer immunotherapy has become an important sector in the biotechnology space, changing the way many cancers are treated. CNCR is the first and only ETF to focus exclusively on immunotherapy and is based on the Loncar Cancer Immunotherapy Index, an innovative index developed by biotechnology investor and Loncar Investments CEO Brad Loncar. In the time since CNCR was launched, FDA approvals for the types of treatments the fund invests in has vastly expanded, including new checkpoint inhibitors, an oncolytic virus and landmark approvals of CAR-T cellular immunotherapies. While the field has made great strides, there is much more work ahead, as the vast majority of cancer patients still need better options. Innovative immunotherapy companies are working hard to build on this progress and play a disruptive role. "CNCR was launched with the goal of helping investors gain exposure to one of the most groundbreaking segments in biotech," said J. Garrett Stevens, CEO of Exchange Traded Concepts. "We are pleased with the reception the fund has received from the marketplace and grateful to investors for their participation in it." Loncar Investments is an official partner of the Cancer Research Institute (CRI), the world’s longest running nonprofit organization dedicated exclusively to harnessing the immune system’s power to conquer all cancers. ETC is carving out a niche as a portal to launch new, custom exchange-traded funds efficiently and cost-effectively through a complete turnkey solution. ETC is a private-label ETF advisor with passive and active exemptive relief from the Securities and Exchange Commission (SEC) to launch both domestic and international equity exchange traded funds under the Investment Company Act of 1940. For more information, please go to www.exchangetradedconcepts.com. Loncar Investments, LLC, the provider of the Loncar Cancer Immunotherapy Index, is committed to making the biotechnology space more approachable to a wider range of investors. The company is principally owned by biotech investor and analyst Brad Loncar. Mr. Loncar manages a biotech-focused family portfolio from his Lenexa, Kansas office. He can be followed on Twitter at @bradloncar and his commentary is available at www.loncarblog.com. The Fund’s investment objectives, risks, charges and expenses must be considered carefully before investing. The summary and statutory prospectuses contain this and other important information about the investment company, and may be obtained by calling 800.617.0004 or visiting www. loncarfunds.com. Read it carefully before investing. The Loncar Cancer Immunotherapy Index is an index of 30 securities that have a strategic focus on the area of cancer immunotherapy, or harnessing the immune system to fight cancer. Quotes for the index can be found under the symbol â€œLCINDXâ€ on the Bloomberg Professional service and other financial data providers.